Think of a World War II military Jeep for a moment. Okay? Now,, what have you got in your mind?I can bet it is ideas such as simplicity, ruggedness, and reliability. Good looks? No way, unless you are a weirdo in terms of aesthetics. Now, tell me to think of the Uru submachine gun. You’re damn right! That’s exactly how I feel about it; the “Jeep”-type submachine gun. 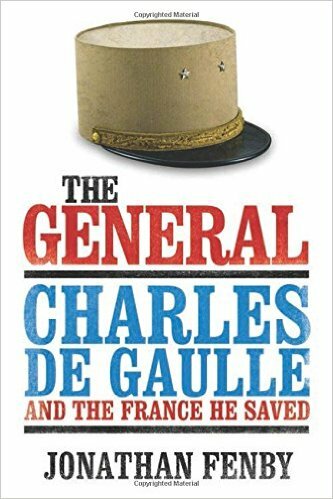 At a time when weaponry in general is getting complicated beyond comfort – sometimes, it would seem, just for the :fun” of it – it’s very heartening to know that we can still find modern, simple stuff around. One such example is the Brazilian Uru (a jungle bird) SMG, designed in the mid-70s by Olympio Vieira de Mello, who at the time decided to create a weapon incorporating characteristics which he considered other guns sadly lacking. 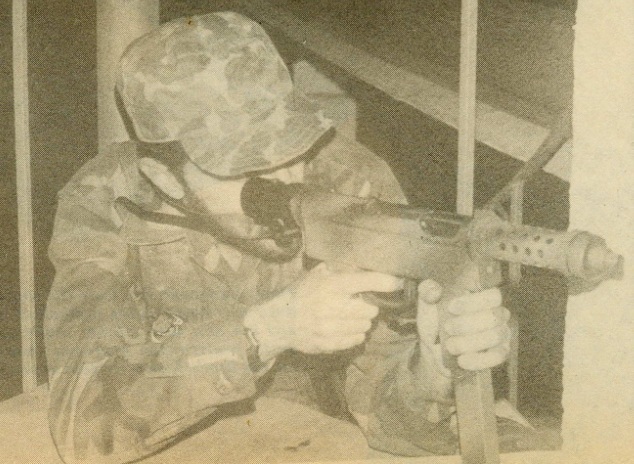 Following a “graduation with honors”: at the end of tough official Brazilian Army tests carried out at at the Marambaia Proving Grounds in Rio de Janeiro, the weapon was cleared for production in 1977. Manufacture responsibility was given to Mekanika Industria e Comercio Ltda, a Rio de Janeiro firm created specifically for that purpose, and this has been going on along the recent years [editor’s note: this article was written in 1985] to meet orders from local police and paramilitary forces (and, reportedly, some Army special units). Export sales have also been reported, but not confirmed. If the Uru has not been seen a wider acceptance, it should be blamed on the firm’s management problems only, and not on the gun itself. Late in 1984, in fact, negotiations were under way for the sale of the production rights to a bigger concern which, it is hoped, will give the weapons a new (and, I believe, most deserved) impetus. That the design is sound and promising is clearly evidenced by the fact that Saco Defense Systems Division of the Maremont Corporation, in the US, is currently marketing its “Model 683” submachine gun, an unauthorized copy of the Brazilian weapon, from which it differs in cosmetic details only. Firing 9x19mm Parabellum ammunition, the Uru operates on the conventional blowback principle, being largely built from tubular elements and stampings. The major components are assembled by welding and spot welding, heat-treated alloy steels being used in parts subject to wear or shocks. The body is a box-like stamped structure with an 80mm-long metal magazine guide (which doubles well as a grip) at the forward end, with the plastic pistol grip and very large trigger guard at the rear. Attached to the top of this is the receiver, a tubular structure closed at the rear, where there’s a spring-loaded button on top for stock attachment. The forward end acts as a thermal jacket for barrel cooling and hand protection, consisting of thirty-six 8mm diameter orifices arranged in eight longitudinal rows. The 175mm long barrel (six grooves, right-hand twist) is fitted into place by its integral mounting nut, which screws to the forward end of the receiver. A screw-on compensator/muzzle brake, adjustable for right- or left-handed firers, is available. Two models of stocks are available for the Uru. The original model is a lightweight (40 grams/1.5 ounces) tubular structure that attaches glove-like to the rear end of the receiver, and is removed form the gun when not needed. 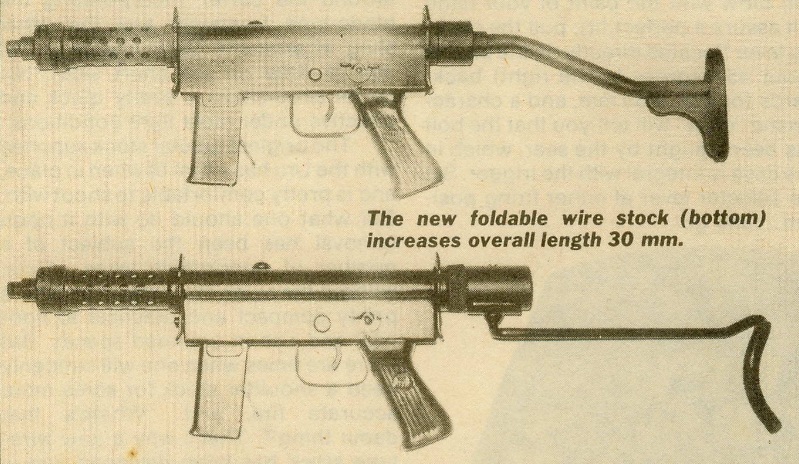 More recently, the manufacturer has also offered a wire-type foldable stock that attaches to the same place. The “Jeep-like” appearance I mentioned earlier is further emphasized when you start handling the Uru, and except for the pistol grip, you see steel all around. The ruggedness of the design starts with the magazine itself. Of the staggered-row, single-position feed type, is it built from 1mm thick sheet steel, but the upper 140mm of its 240mm total length is reinforced with an additional sheet giving its side and rear walls an actual thickness of 2mm. So, the feed lips (a most sensitive part for any gun’s operational reliability) are particularly tough, and intentional drops and blows on hard surfaces didn’t result in deformations. In addition to that, the magazine well has a total length of 105mm, which keeps the magazine snugly fit in its place, and a small flare at the forward end of the guide lips facilitates quick insertion. The magazine catch is a sturdy blade at the rear of the guide, and has to be pulled backwards to release the empty magazine. Although this arrangement makes magazine changing a two-handed operation, the probability of accidental magazine dropping is definitely much more remote. As we are talking about magazines: the single-position feed type are inherently more difficult to load by hand, and the Uru’s is no exception. It takes me about two minutes (and some sweat and a scratched thumb) to squeeze twenty rounds into it…and give up loading the remaining ten! By using the magazine filler that comes along with the gun things get a lot easier: the 30 rounds can be easily be loaded in 70 seconds, no sweat. With a loaded magazine, the Uru weighs 3.70kg (8.15lb), which is well within the average for weapons of its class. Without the stock, length of the gun is 425mm, and the original tubular stock makes it 670mm long overall, and the extended wire stock, 700mm. Wire stock folding reduces this to 470mm. On the left side of the body, above the pistol grip, is the fire-selector lever with the three traditional positions; “A” (automatic), backward; “SA” (semi-automatic), upward; and “S” (safety), forward. The safety position solidly blocks the trigger action, allowing the gun to be carried in the cocked (bolt at the rear) condition at no risk. Realistic setting changes with the thumb of the right hand is out of the question as a result of the lever;s elevated position, but the left hand can perfectly do it at the blink of an eye, so…what the heck! Still under the safety aspect, accidental firing as a result of drops or violent blows on the back, a common (and most hazardous) problem in open-bolt weapons, is dealt with by the design with a very smart and sturdy inertial locking device, which positively blocks the bolt after a rearward travel of under 10mm only. I’ve tried a whole lot to “cheat” the device into failing, by dropping the Uru from as low as 40 or 50mm, shaking it back and forth in the air, hitting it strongly against hard surfaces, etc. All to no use: it worked faultlessly all the time. The Uru is brought to the “ready for business” status pretty much like most other submachine guns. Insert a loaded magazine all the way into its housing (a firm blow with the palm of your hand will assure a perfect fit), pull the cocking lever (located directly on the bolt, at about 45 degrees to the right) backwards for about 60mm, and a characteristic “click” will tell you that the bolt has been caught by the sear, which in this case is integral with the trigger. Set the selector lever at either firing position…and go! The gun is factory sighted for 50 meters, which I consider perfectly all right for the intended operational roles of an SMG. The rear sight is a 2mm diameter aperture in the 3mm thick structure that fixes the receiver to the rear end of the body and doubles as a sling attachment. A similar structure exists at the forward end of the gun, just aft of the perforated thermal jacket around the barrel, incorporating the blade-type front sight and the other sling attachment. Sight radius is 230mm (a little on the short side), but target acquisition is pretty quick and effective under most conditions. The original tubular stock supplied with the Uru has a firm fit when in place, and is pretty comfortable to shoot with. But what one should do with is upon removal has been the subject of a number of unprintable jokes… Sure, without the stock the weapon becomes pretty compact and practical to conceal and use in cramped spaces. But there are times when one will suddenly need a shoulder stock for some more accurate fire, and… “Where’s that damn thing?” That’s why a new wire-type stock has been designed and is now available for the gun. It fits the same place at the rear of the tubular receiver, and a threaded ring assures a definitely solid attachment. If its 15mm-diameter, rubber coated shoulder rest may seem less comfortable than the 35mm-wide metal buttplate used earlier, this is not, in fact, the case. The mild recoil of the 9mm Parabellum ammunition contributes to this to a great extent, and the shoulder support you really need is practically symbolic. As a side-by-side photograph will show you, the firer’s face is given more clearance against the stock, and the added 30mm in length improves the hold. The new stock is spring-loaded into either position, with no levers or lock to fuss with, and lies very flat (totally flat, to be more correct) to the right side of the body, in no way interfering with the operation. I do have some minor criticism of the design, though. The trigger is too short for the good-sized trigger guard, leaving a gap of 13mm between them. A thin-fingered firer, like me, may have his finger sliding past the trigger, when bringing the Uru into action hastily, delaying the reaction time and eventually having fatal consequences. A mere 10mm increase in trigger length would solve the problem. The Uru fires form the open-breech position, and the momentum of the bolt slamming forward immediately prior to firing a round in the semiautomatic mode – like in all other similar SMGs – certainly gives the muzzle a downward jerk. However, any reasonably trained shooter will have no difficulty hitting man-sized targets even beyond the “official” 50 meter range of the weapon, and – let’s face the facts of life – a submachine gun is no toy for amateurs! The well-balanced recoil-to-weight ratio allows an average marksman (my case) to place all the 30 hits of a full magazine in the “kill” zone of a silhouette firing one round every second, or more loosely spread over the target, at about twice this rate of fire. 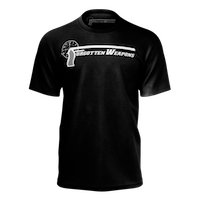 With the weapon supported, a tighter impact radius is, of course, achieved, and the bench rest groupings at 25 meter range average something in the range of 20mm! Muzzle velocity, incidentally, is about 390 m/s (1280 fps). At full-auto, the Uru has a cyclic rate of fire of around 750 rounds/min, somewhat on the higher side, but definitely within the limits of good sense (yes, I’m talking about Ingrams and Mini-Uzis!). The results you get from automatic fire depend more on your individual skills than on the weapon’s inherent characteristics. What I can say is that it’s pretty stable and highly controllable during either long or short bursts. 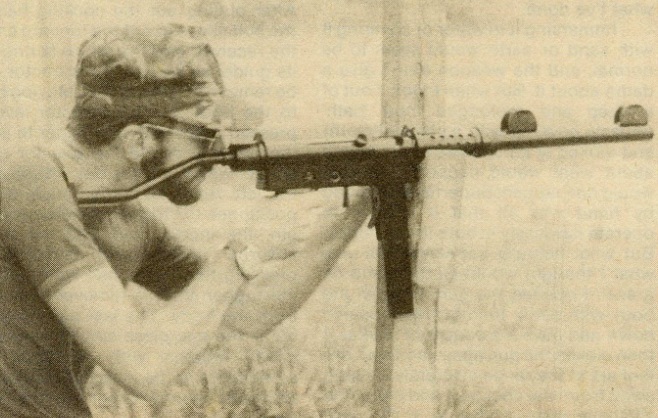 And you may forget that metal forward grip (actually the magazine housing) to use the gun for shoulder- or assault-style firing: that perforated forward end of the receiver is perfect to rest on the supporting hand (shoulder firing) or be grasped by it (assault style). The barrel does not overheat even after consecutive bursts. 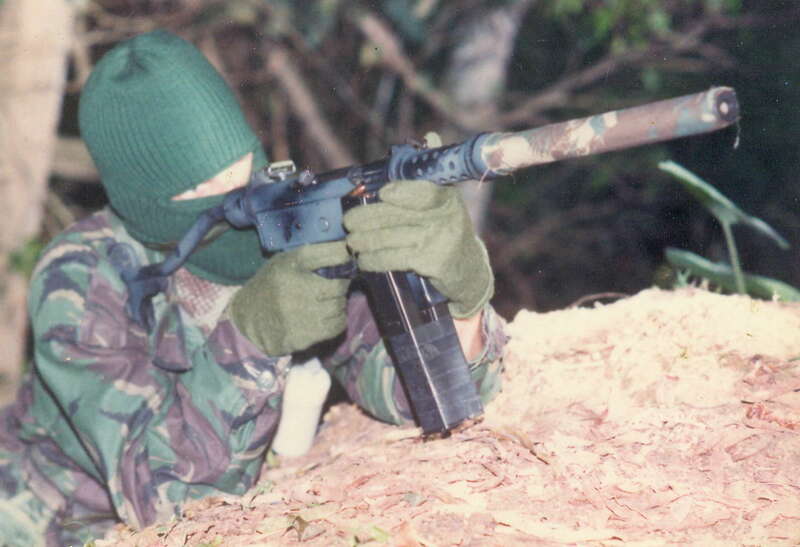 If you favor the popular [editor’s note: in 1985] arm-tuck position for assault-style firing, the older tubular stock is no doubt more convenient than the new wire type unit. The buttplate is so positioned that it is at the point of contact between your bicep and rib cage, a most firm hold, no doubt about it. The new, thinner stock is not so comfortable for that purpose. Remove the stock altogether, and the 425mm length of the gun makes it pretty compact for situations demanding so. But my choice for such circumstances is the wire stock in place and folded to the side: it adds only 45mm to the length, and is there in case you need it. Although the stability, as mentioned above, is outstanding, the manufacturer still offers a compensator/muzzle brake that attaches to the forward end of the barrel, and is adjustable for right- or left-handed shooters. It keeps the Uru rock-steady even during long bursts, but, God, does it make it noisy like hell! For the sake of my hearing capacity, I would reserve it for special occasions at the range, when delicate creatures (with protected ears) want to explore the world of full auto for the first time. For special operations, the Uru can be effectively silenced. Instead of the more usual add-on suppressors, whose rigid fit often leaves something to be desired, the weapon has an integral barrel/silencer unit that simply replaces the original barrel. Just unscrew it and substitute it with the silenced one, an affair that will not take you more than 20 seconds. The 420mm long, 20mm wide assembly does make the SMG rather long (715 and 945mm, with the wire stock retracted and extended respectively), but as you hear it performing you will agree that the trade-off for quietness is worthwhile. Since the gun fires from the open-breech position, the noise of the bolt slamming forward is, then, unavoidable. But that’s about all in terms of sound report. In real-life situation, that sentinel will never know (wherever he may end up) what hit him, and the “bad guys” talking inside the room will be thinking at most that someone coughed outside. The silencer, by the way, is a sealed unit, requiring no maintenance or parts substitution. A close exam reveals that the barrel used is, actually, only 75mm in length (which starts reducing velocity from the very beginning of the bullet’s path), and the remaining space is occupied by conical metal baffles spaced about 7mm between each other, which effectively reduces gas velocity. I’ve fired a great deal with the basic silencer; which provides pretty accurate fire at 50 meter ranges. More recently, the designer has come up with a unit which incorporates its own sights. These are protected with massive “ears”, the rear sight being a fixed notch and the front sight being an adjustable (windage and elevation) post, with a radius of 210mm. When zeroed for a particular shooter, it will automatically be so for whatever Uru you use it with. An interesting detail is that although the notch is marker “50”, it just so happens that it also provides sighting for 100 meters. The explanation given to me is that the bullet’s trajectory crosses the line of sight at exactly both distances. I tried it at a silhouette at 100 meters…and it worked perfectly all the time! If a gun works reliably under normal conditions, I call it a “prerequisite.” If it also does so under very adverse conditions, I call it a “quality.” And the kinds of torture that the Uru can withstand has to be seen – or tried by oneself – to believe. That’s exactly what I’ve done. Immersing it in water or covering it with sand or earth would seem to be normal, and the weapon didn’t give a damn about it. But when I took it out of a deep and prolonged mud bath (muzzle covered with a piece of cloth) and looked at it I confess I had doubts about what would happen…or what would not happen! Superficial cleaning by hand was all that was needed to operate flawlessly in both firing modes. But what actually impressed me was what I thought would be the coup de grace. I opened to gun, filled _all_ the body with earth, then turned it upside down and gave it a couple of shakes. I then closed the gun again, and with onlookers at the range discretely walking away from me, cocked it and unloaded a full magazine at full auto, as if the Uru had just been taken out of the box! The “secret” is that all its mechanism is built to great tolerances, which is fully confirmed by the fact that no part is numbered, except the body, and interchangeability is total. 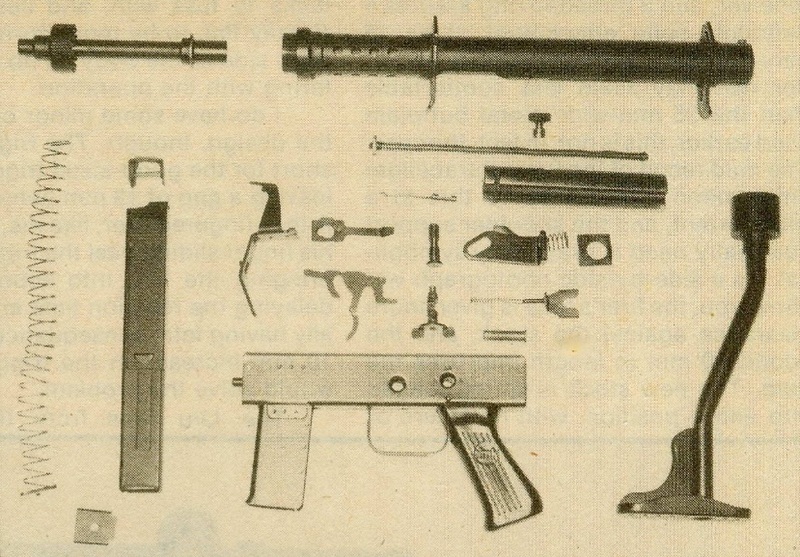 By cleverly designing them, several parts have two functions, such as the trigger (which incorporates the sear), the magazine catch (which doubles as ejector), the catch leaf blade (also used by the trigger), and the sole coil spring of the whole firing mechanism, used both by the fire-selector positioner and the disassembly pin. The only other spring in the body is the one used by the inertial locking device. The Uru has, actually, only 17 components including the magazine, too; and as a result of no pins or screws of any kind being used, it can be totally disassembled in under 60 seconds. After removal of the magazine and stock, the nose of the cartridge or any similar object is used to push a button at the back of the receiver inwards, which allows the receiver to be lifted at the rear and disengaged from the front end. The barrel is then pulled out by unscrewing its integral mounting nut. After pulling out the cocking handle, the bolt slides out of the forward end of the receiver, and the return spring and its guide, as well as the extractor, can be removed from the bolt. Moving back to the body, the fire-selector lever is pressed down wit one finger to allow the removal of the fire-selector positioner, which comes out sideways to the left. Removal is then made of the positioner, the trigger, the disassembly pin, the inertial lock and the shock absorber, together with its spring. By pressing the trigger leaf spring down, the trigger shaft is removed sideways from the body. The last part to come out is the one-piece ejector/magazine catch, together with its blade. Reassembling is the inverted procedure, and takes slightly longer than the takedown. An instruction manual would be better in order to understand how it really works.. Number 2 appears to be the inertia lock for the SMG Bolt. Although in fairness, the “Star” mechanism is also supposed to protect against run away firing with squib loads or bolt recoil too short to engage the firing sear. The Star Z62 had a very elaborate inertia lock in the bolt, allong with a moving striker. A nice thought, but undoubtedly requiring lots more expensive machining on the alloy steel of the bolt. 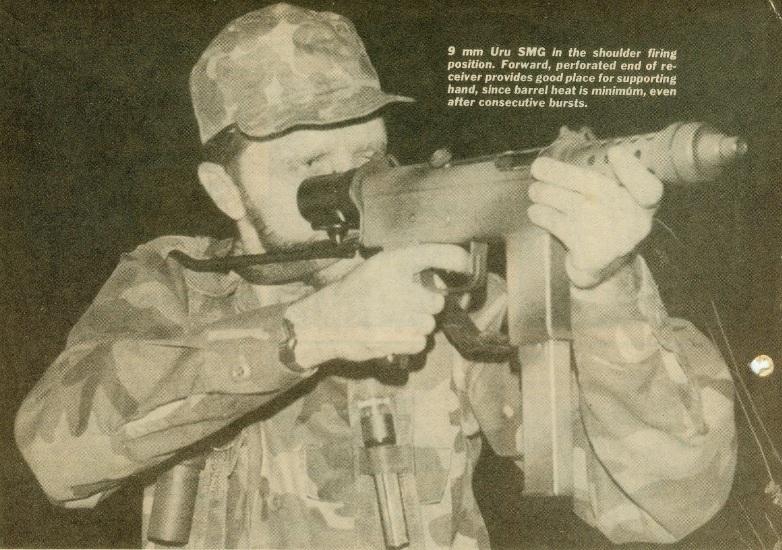 Great article on this smg that is really rare to found informations about. Talking about genious design : many dual use parts (ejector-mag catch), and my oh my, one piece trigger-sear-disconnector! Could it be simpler than that ? Only thing that could be improved here is that funny oversized trigger guard (but I suspect maybe designer did it with some purpose? glove firing or…?) and more important to use dual feed magazines (for example the one from Uzi). Other than that it is a pinnacle of simplicity and cheap manufacture, ugly looking of course, but also very reliable which is most important.